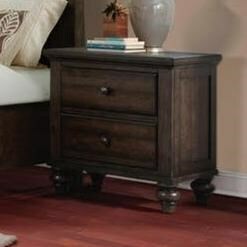 This lovely traditional nightstand is the perfect accompaniment for your master bedroom ensemble. Two storage drawers will keep books, reading glasses, and other essentials close at hand. The elegant piece features a nice medium wood finish, and pretty turned wooden feet. The Chatham Gray Transitional Nightstand with 2 Drawers by Elements International at Miskelly Furniture in the Jackson, Pearl, Madison, Ridgeland, Flowood Mississippi area. Product availability may vary. Contact us for the most current availability on this product.